Bessie Marie (Avera) McKinnon, daughter of Webster Daniel Avera and Martha 'Mattie' King Avera, a daugther of Sanford and Sarah Cooper King, circa 1921. She was born 24 March 1895, and died 12 November 1951. She married James Carter McKinnon, son of Reddick Charles and Carrie Ann Jane Goodman McKinnon, 14 May 1911. 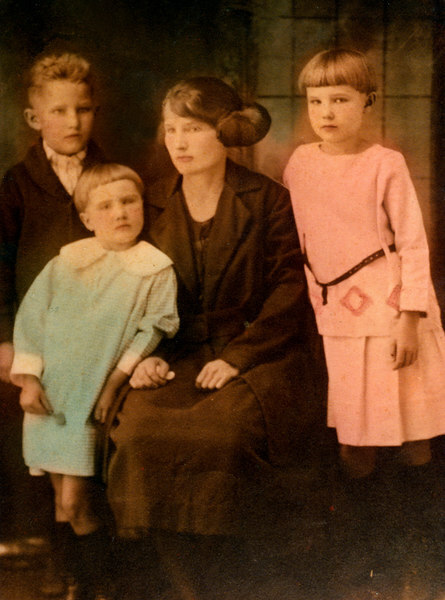 Pictured are their first three children, Aubra Daniel McKinnon, Neva Lois McKinnon, and Louelle Marie McKinnon, the oldest, to the left of her mother.